Here's another fish disentanglement puzzle. Try to free the shark from the jaws of a whale. 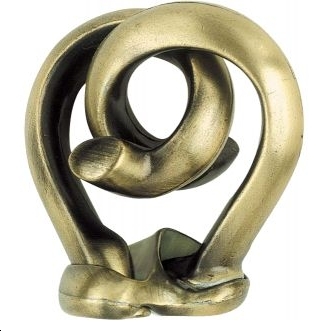 Again, it's a disentanglement puzzle without wire, string or rings. And the metal is so cool. Remember: always buy 2 or 3 copies. Keep 1 for yourself. The others you give as gifts to nieces & nephews. 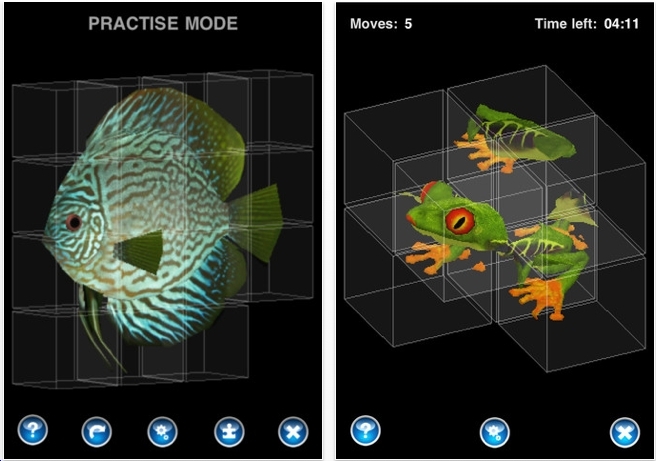 Ian McColm recently contacted me about an update to his puzzle app Inakube. 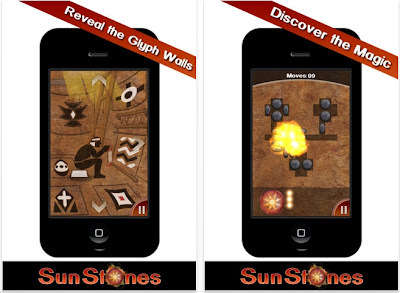 Which received an honorable mention for best puzzle apps of 2011. Here's what's particularly cool. The earth puzzle is just a simple 2x2x2 sliding cube puzzle, but there is a partial moon that rotates partially around it - not necessarily in an eliptical orbit! 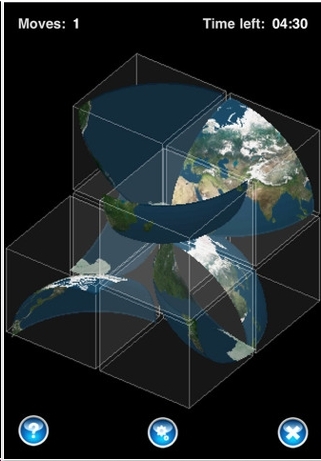 It depends where each continent/ocean is. Very slick. Yesterday's puzzle app was a dog, so here's a good one. 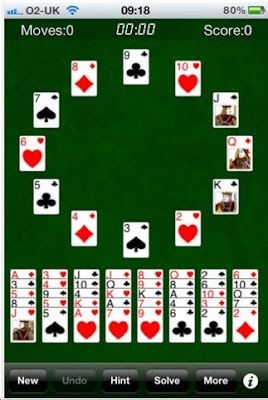 Hexagons is very similar to SET, the card game of 81 cards. The object is to arrange tiles in a hexagonal circle that have either the same trait or a completely different. Right now, I'm the high scorer as evidenced in the leaderboard (that accomplishment and $2.25 gets me on the subway). Hexagons is the sequel to Rows Free. Rows Free is awesome; Hexagons is a version that is not necessary. Still, I've played it enough and will not delete it! Scroll down on this blog and look for Rows Free. That's the one to play. The object is to get the red ball from the upper left corner to the bottom right corner. You can rotate the tiles. I believe that the tiles must match colors with each other; but I'm not sure. 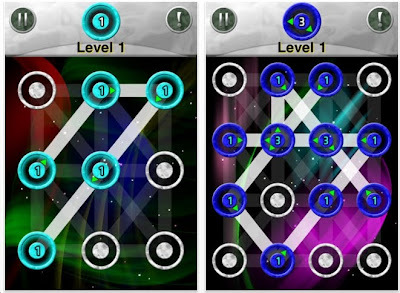 I have not been able to solve the first level - I think it's impossible. If you can figure this out, please contact me to explain this. Mario Ruffolo is the author. A Plumbers Job: the object is to put the given elbow pipes and complete the path. 50 levels. I did the first 15 levels and got bored. Definitely for younger puzzlers. 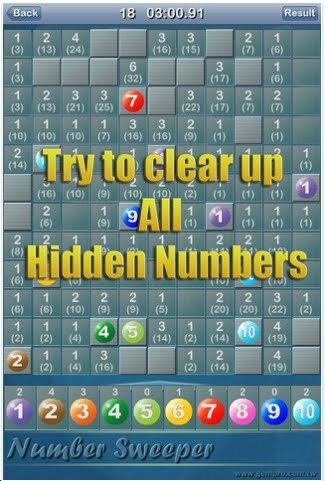 Number Matrix comes from the same people who brought us Number Sweeper which I reviewed about 2 weeks ago. 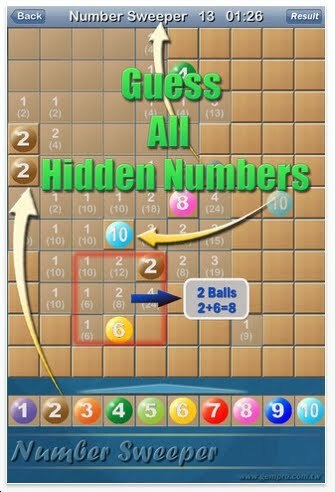 The puzzle: a Number Sweeper grid has already been solved. The object is to figure out which numerical bombs go where. Not very challenging. There are times, as in minesweeper, when you must guess and cannot use logic. n the summer of 1997, I saw two mackerels that had somehow managed to get into the sardine tank at the aquarium. Watching these two fish unable to blend in with the shoal of sardines made me wonder if they were on a journey of self-discovery. A sea bream and a mackerel enjoying themselves getting tangled up together. Take them apart, and then put them back together again. 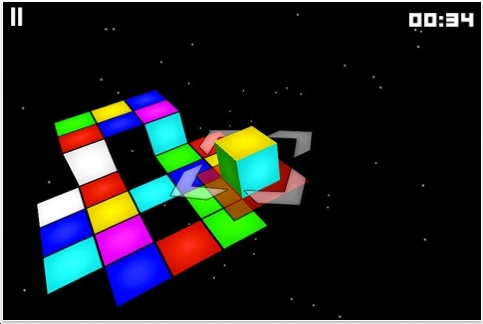 The object of D Blocks is to swipe away all the blocks that have arrows within a given number of moves. Swipe the green blocks up (and away) and the blue arrows will line up nicely. There are 25 levels - I solved them all in about 1 hour. I got stuck on some of the levels. Good fun. I'm looking forward to more levels. 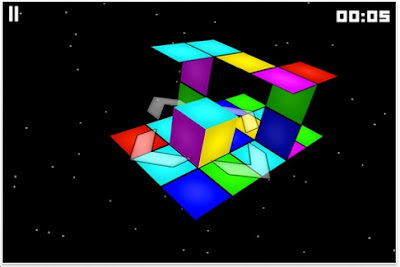 D Blocks was designed by Mike Singleton. When I was younger, I played many varieties of solitaire. This version is interesting. It's free, so give it a try. 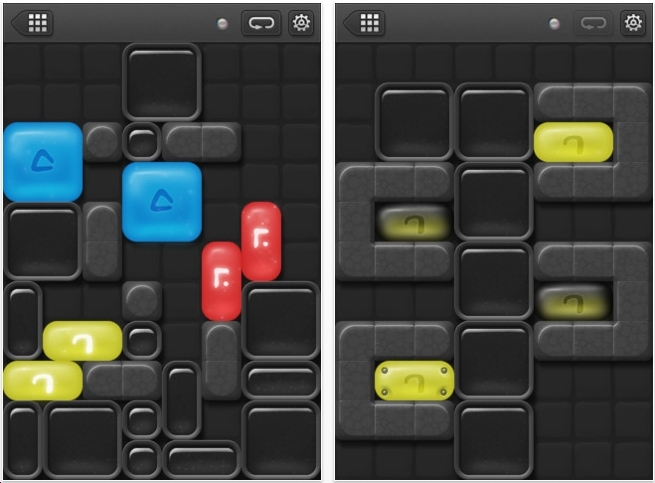 Blockwick was created by Kieffer Bros, the makers of Aqueduct and Aqueduct 101, which are fabulous puzzle apps. 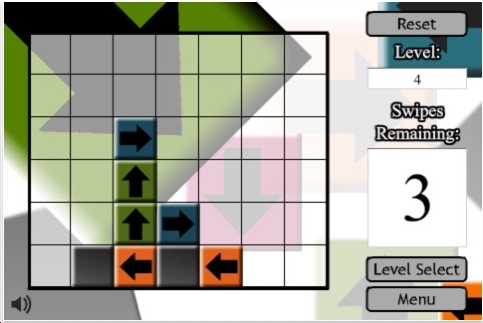 The object of Blockwick is to slide the colored tiles so they are adjacent to each other. Then they glow and you win. 60 free levels. I've solved them all and have purchased the additional levels. 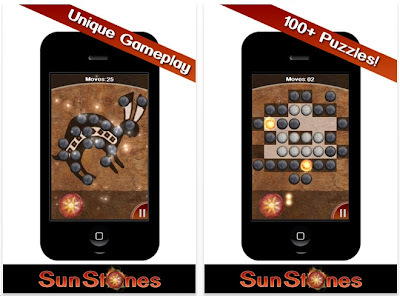 Does it make the list of best puzzle apps of 2012? Not sure yet. But it's definitely quite good and challenging. 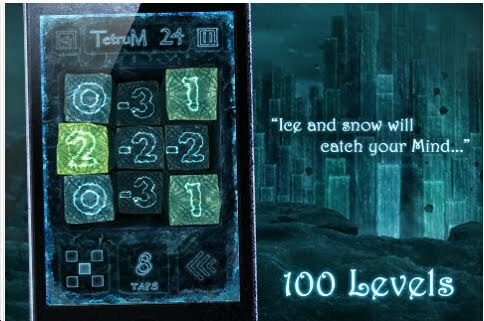 My first thought when I saw Frozen Equilibrium: Lights Out with numbers. Not quite. 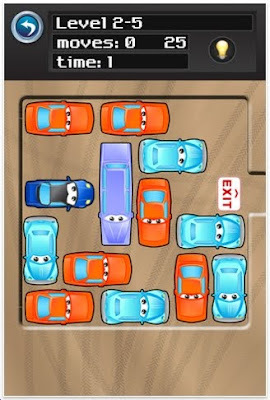 Like Lights Out: press on any square and that square's number decreases by 1 while the surrounding tiles increase by 1. The goal is to get all the tiles to 0. Tricky variation not found in Lights Out: tap a square and that affects all the other tiles in that row & column. 100,000th visitor is it you? Loyal viewers, this blog will soon have been visited 100,000 times. If it's you, send me a screen shot and I'll send you a prize. 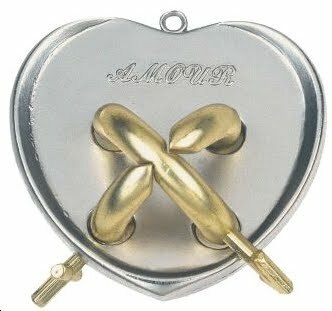 Okay everybody, I have a confession: I can't solve this puzzle. I have played with it numerous times over the past 4 years and keep hitting a roadblock. I know I'm close. Here is the solution page, but I refuse to look at it! Sunk! 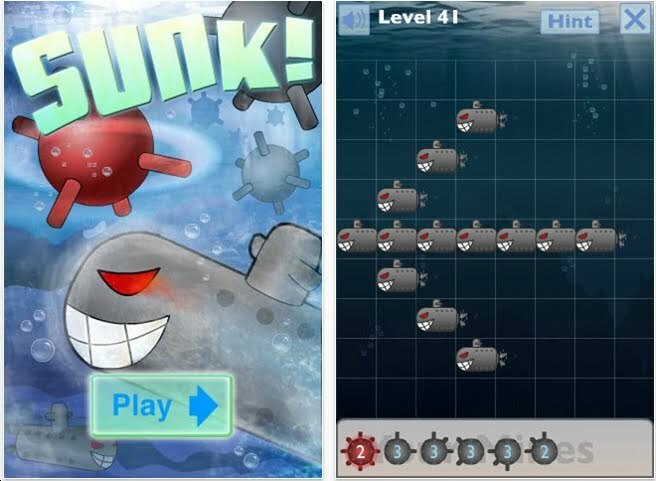 is a terrific puzzle app where the object is to sink all the enemy submarines while keeping friendly submarines from harm. Place the red bomb first in the grid. 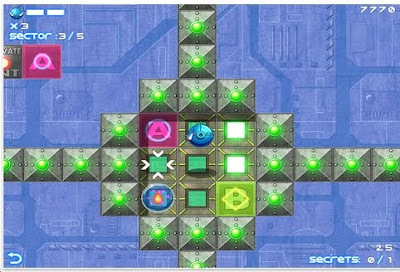 This sets up an area - the surrounding 8 squares - for the grey bombs to explode. The free version has 12 levles. The paid version has 75 levels. All difficulties. I have solved about 35 levels. Challenging and fun! Car Valet is yet another version of Rush Hour. This version is free. I played maybe 20 levels. Then realized I just cannot play this game anymore! The graphics are nice. And it's a free puzzle app. Click here for some geeky laptop humor. 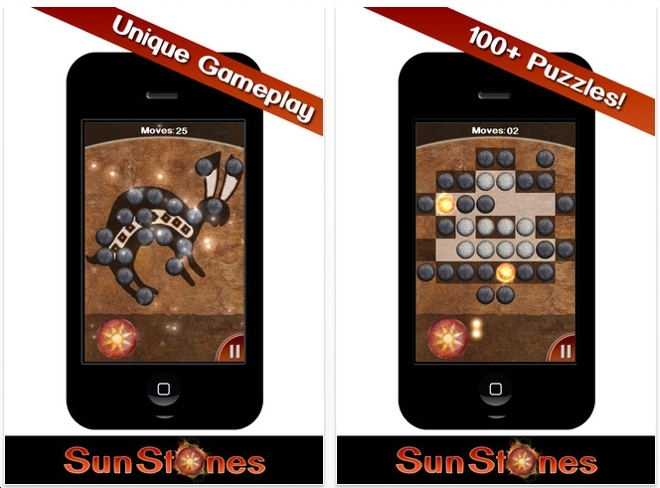 Simon Strange recently contacted us about his new puzzle app Sun Stones. The rules and objectives are not posted on the app, so I won't spoil it. Suffice it to say, you have to figure out a series of puzzles. There is an overall mystic, American Indian feel, which is interesting, but I've ignored it to focus on the puzzles. 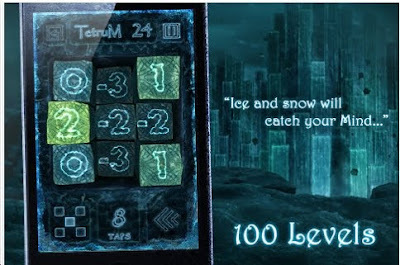 There are about 50 free levels. Not difficult. A few of them, I had no idea what to do, or how to do it. But managed. Bottom Line: I've bought the next 3 sets of puzzles. 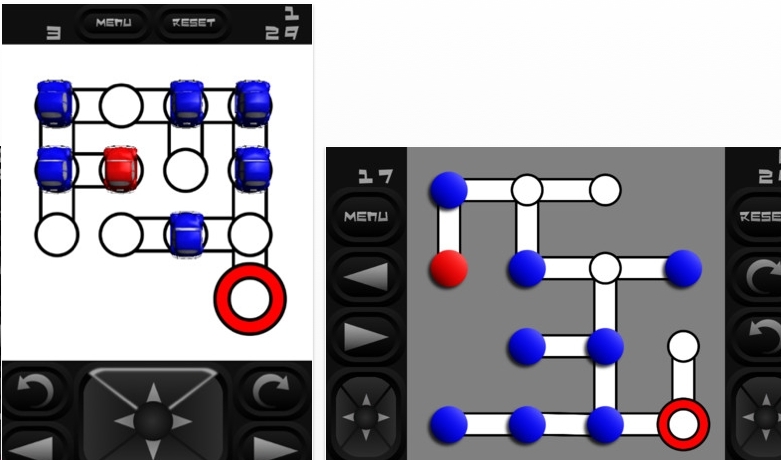 Pattern Puzzle by Hwang Gyu Sung is a topology based puzzle app with many levels of all difficulty ranges. Each big dot has a number which indicates the number of times your path must pass over that dot. What makes this very interesting is that each path between dots can be used twice - one in each direction. The object of Cast Armour is to disentangle the 3 pieces. Valentine's day has passed, nevertheless, you can give this to the one you may or may not love. If they can solve it, proceed! If not......you make the call. 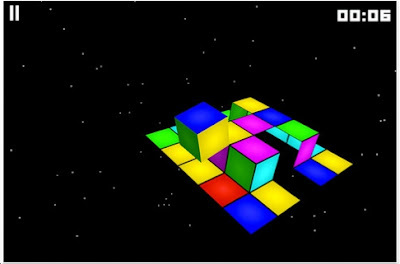 Cubler 2 is a rolling cube maze puzzle. The object is to roll your cube so the yellow face matches the face on the plane. Notice in the other pictures that the plane is not always a plane. There are 15 levels. I've solved them all in about 73 minutes. 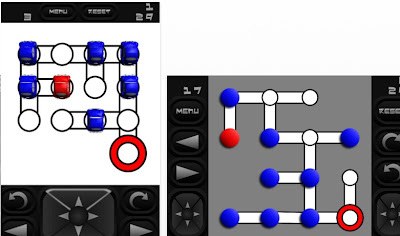 Right now, Cubler 2 is a fantastic free puzzle app for the iphone/ipad. Even if Steven Delrue, the author, starts charging $1.99, it's well worth it. 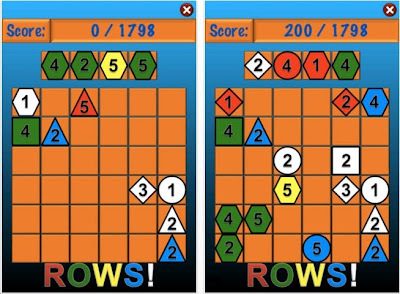 Fans of Tripevo and SET: you will love Rows Free by Nickolaos Kechagias. The object is to score points by aligning 4 tiles in a row that have all the same properties or different properties. You are given 4 tiles at a time and can place them anywhere in the grid. Each tile has one of 5 colors, one of 5 shapes and one of 5 numbers. Therefore there are a total of 125 different tiles that can be generated randomly. Rows Free cannot be played quickly. My high score right now is around 22,000 points, which took me 2 hours to accomplish. (That was one game.) The person with the highest score is 'Chunky1948' with 125,676 points. In 2nd place is 'Joy1127' with 107,790 points. These are incredible scores. If either of you ever read this, let us know how many hours that one game took. The paid version of Rows is .99. That's cheap and you'll never have to look at those annoying ads. 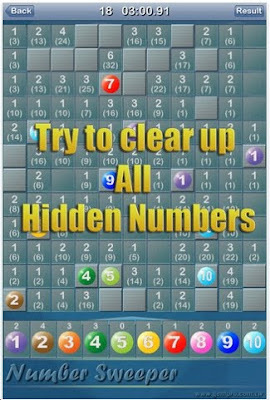 Easily one of the best puzzle apps of 2012. 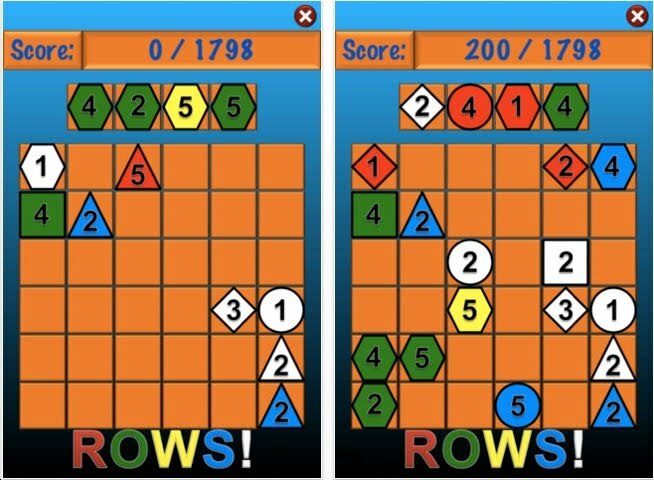 Rows Free easily makes its way onto the list of best free puzzle apps of 2012. Bravo Nickolaos! 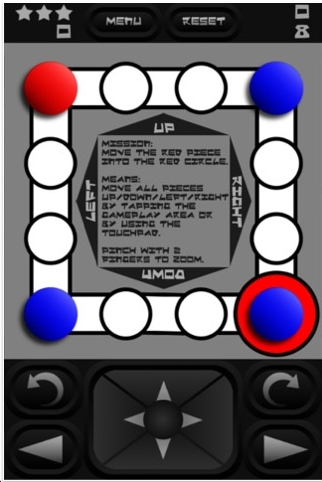 Red Mix comes from Ivan Vassilev, who also made the terrific puzzle app: Tjam. The object of Red Mix is to get the red dot to the red circle. This is a tile maze where all dots can move up, down, right, left as far as possible. 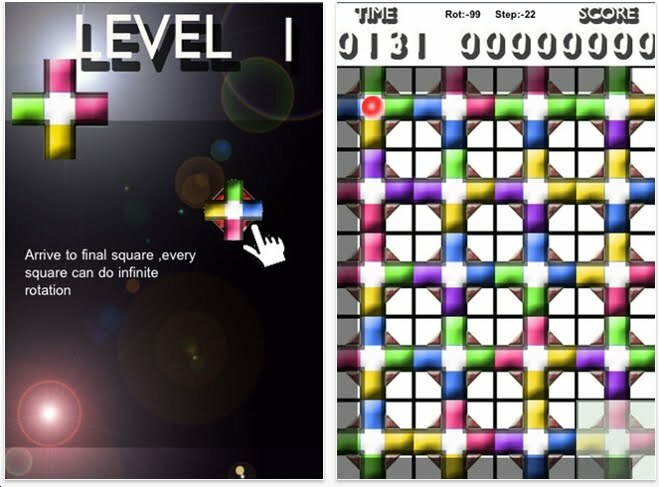 Red Mix has 200 levels - this will keep you busy for a solid year. 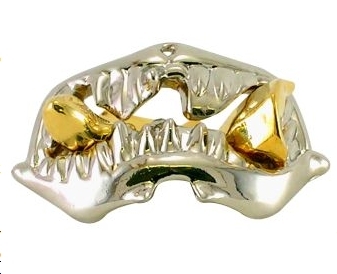 These are tough. Right now I've solved about 10 levels. Terrific job Ivan! 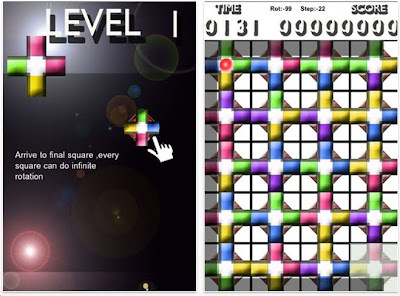 Cosmic Tiles is an action puzzle game. I played this for about 20 minutes. It's a little too Star Wars-y for my taste. Kids will like it. Cast Medallion comes from Oskar van Deventer. 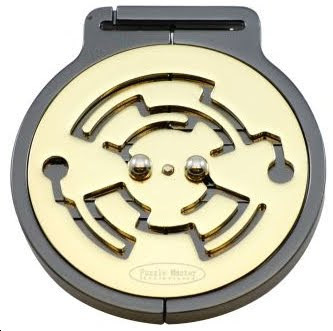 It is a double sided maze made from 4 discs. The object is to dismantle the puzzle into 4 pieces. Cast medallion was originally made in 2003 in plastic. It was prototyped by George Miller. The plastic version is more colorful; however it is more fragile. It is one of those puzzles that I won't let other people play with. This metal version is indestructible. This one, I'll let guests play with. The directions posted for the app itself, are not clear. 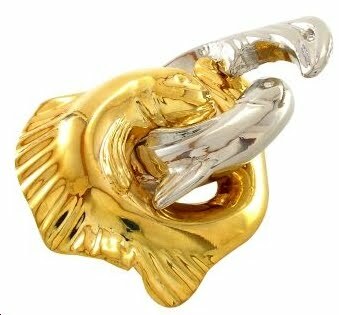 Look at the image above. Look at the cell near the top left corner. Notice it says 1 with (2) underneath. The 1 means that 1 bomb is nearby. The 2 means that the sum of all the bombs near it add up to 2. So, each bomb has a numerical value. Mine Sweeper has a feature for speeding up the solution; Number Sweeper would be better if it had this feature. Still, Number Sweeper is worthy of your time. Is it one of the best puzzle apps of 2012? Probably not. But it'll be a runner-up.